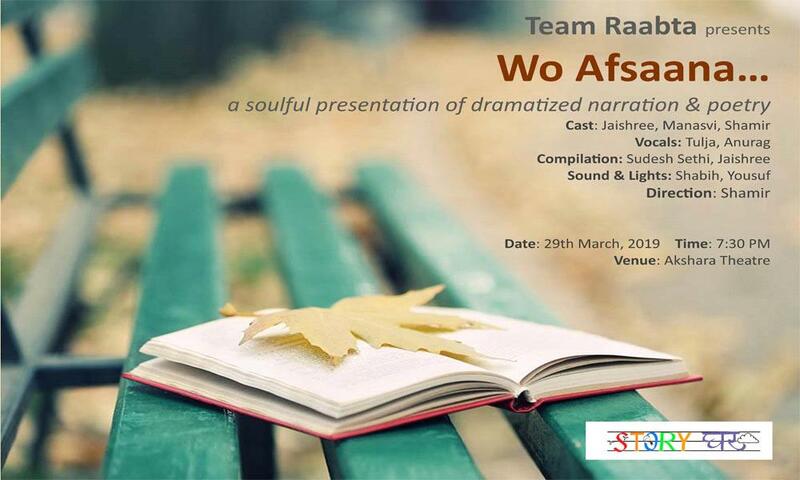 Team Raabta presents their stage play event 'Wo Afsaana…' at Akshara Theatre,Delhi on 29th March, 2019. Team Raabta is happy to announce their latest stage play titled, ‘Wo Afsaana…’ at Akshara Theatre on 29thMarch, 2019. It is a tribute to two celebrated authors in the history of Indian literature, whose names when taken together evoke passion, unconditional and unrequited love. The unsaid and unspoken bond between renowned Punjabi author Amrita Preetam and notable Urdu poet and lyricist, Sahir Ludhiyanvi. The musical and theatrical presentation weaves the pain and wishful & unfinished love between the two poets through dramatized narration of their life snippets, poetry recitation and song renditions.